My father in law has been visiting from San Antonio this week and all we’ve done is eat. I swear, I feel 40 pounds heavier. It’s not bad enough that my brother left a couple weeks ago and all we did when he was here was…eat. We do go see the sights and the beautiful mountains, but we also eat…a lot. I have been making breakfast almost everyday and if you knew how I felt about breakfast, you would be very proud of me! What doesn’t help is that my husband took time off work, and because he’s home I feel compelled to make it special for him. At this point in time, I have literally given up on any kind of a diet or watching what I eat. I have no will power when you wave a beautifully, golden brown croissant in my face. Right after my father in law leaves next week, my best friend from Houston arrives on the weekend, and we together, are notorious eaters! Right as she leaves, my sister and her family arrives in July. Phew! See my dilemma? How am I to ever lose all this weight with company coming every week and me having to cook for them?! I love having my family and friends visit and I thoroughly enjoy cooking for them but I am feeling quite heavy already and heavy=sluggish=unmotivated=laziness. My one reprieve is that Ramadan, the Islamic month of fasting will arrive middle of July, so I shall take full advantage of the fasting from dawn to dusk. So, this is just a quick frittata I made today for breakfast. I will not have much time coming up and I wanted to post this before I got too involved with stuff (eating). It’s been hard to sit at the computer to do anything especially update my site. I cook everyday but I am so tired by the end that the motivation to take pictures and write about it is shot. There is no way that I am that organised to have posts ready to go and pictures all sorted to press that “publish” button at any time. Anyway, I know everyone knows how to make a fritatta but here’s my concoction from today. It was really good and very filling, thanks to all the fresh vegetables. 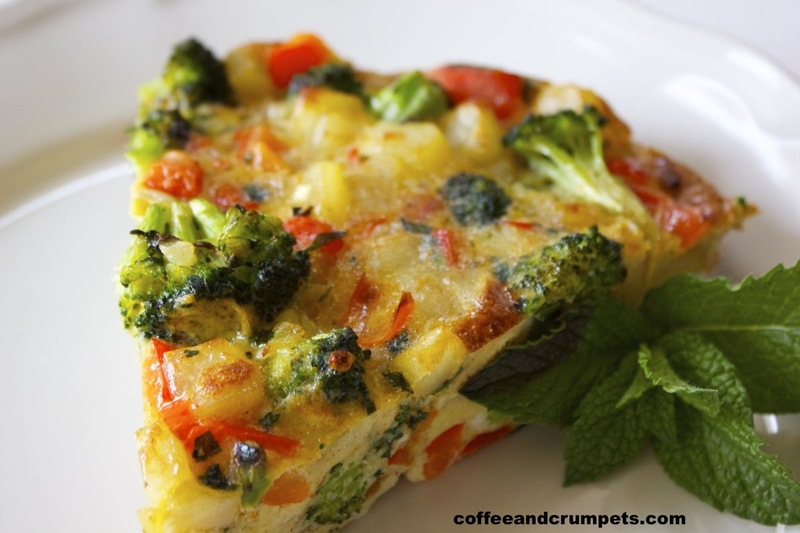 What’s in your favourite frittata? Heat the oil in a large 12″ non stick fry pan and add the potatoes. Fry the potatoes till light golden brown and fully cooked. Add the onions, peppers, broccoli and garlic and fry till soft and broccoli is crisp tender. Meanwhile crack the eggs into a big bowl, and beat with the paprika, salt and pepper. Pour the eggs into the pan with the vegetables, sprinkle the herbs over the top. 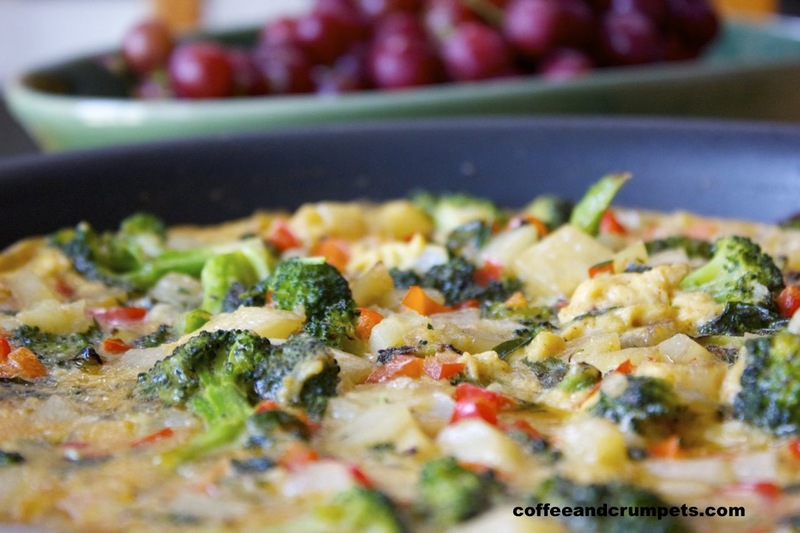 Mix the eggs into the vegetables gently so the eggs can begin to set in the pan. Keep the heat on low and let the eggs cook gently and set up. I always broil the top of the frittata rather than try to flip the whole thing and risk a huge mess. Once the eggs have set and only the top is a bit wobbly, turn on the broiler and place pan underneath. Keep an eye on the top and broil till nicely browned on top and all the liquid has set. Slice into 6 generous slices. Serve a apart of a breakfast, brunch or a light lunch. So, when y’all have guests, do you over indulge? Wow sounds like you have been and will be busy with the guests! But I bet everyone is happy since you bake and make good food like this! I’d be happy waking up in the morning and this was on the table! Seriously! 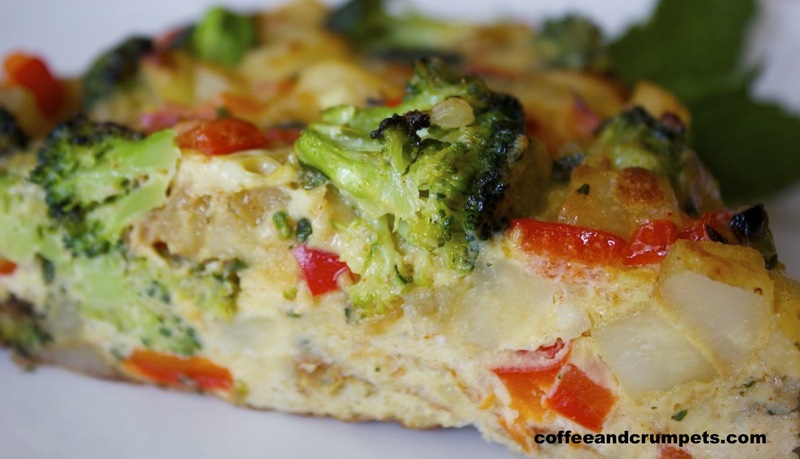 I love your frittata! Thanks Nami! I am busy with guests. My friend comes in Saturday and I am trying to get my house ready since my father in law just left. Wish me luck! I know that it is hard to eat healthy when you are entertaining your friends and family. Just enjoy them and when you are fasting the weight will come off. Your frittata looks delicious and I’m sure was throughly enjoyed by everyone. I’ve given up on it at the moment. I’ll deal with losing weight later! Thank you for stopping by Karen. Thank you so much! Great for breakfast, lunch and dinner. 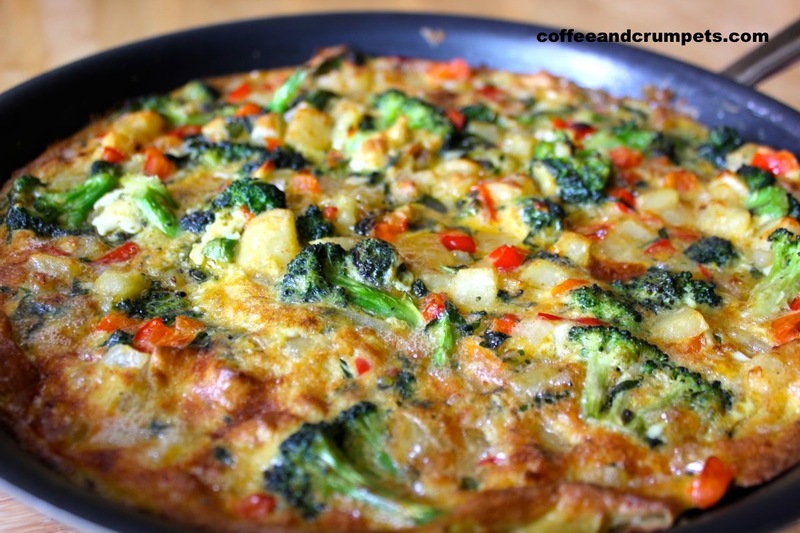 What a gorgeous frittata! Nazneen, you are so talented: your vegetarian dishes are so beautiful even such a meat lover like me is seriously tempted every time! Thank you Sissi. Believe me, my family are huge meat eaters so I have to be creative with non meat dishes to tempt them. Healthy and scrumptious! A wonderful dish. Thank you CJ! That’s the excuse we need right? Nazneen, that looks soooo yummy!! I love cooking too, but I so agree with all the eating when we guests. The fact that you are even updating the site with all that cooking (and cleaning, shudder!) is commendable in itself. Reminds me to get myself a bit more organized before my guests start arriving in two weeks. Thanks Minnie. It was a spur of the moment thing because I only had two potatoes and couldn’t make my full English breakfast, so I made this. It turned out well. I don’t want to lose my motivation to post so I made time to do it, but I don’t know about next week. I will have to write some up ready to go. But my pictures take so long to edit etc, it’s a headache at times. Good luck with your company. Do you cook stuff ahead of time? I am thinking of trying to at least make some koftas or sheekh kebab ahead and stick them in the freezer. My sister is coming for like a week! My hubby’s a darling and he does all the dishes for me so I am so grateful to have him. I try to do some of the cooking, but honestly, it can be a tough call. And even with all the pre-cooking planning and preparation, it can still be a whole day kitchen schedule. Pictures are by far the most taxing thing about blogging….honestly. Your pictures are jaw dropping gorgeous, and I am only beginning to appreciate the amount of patience and eye it takes to churn out one great picture after another. Nazneen, I know you are very very busy,but I had to award you the Versatile Blogger Award. Thank you my friend! I will officially accept as soon as I have time to sit down without having to cook something first! Thank you again for the award Minnie!